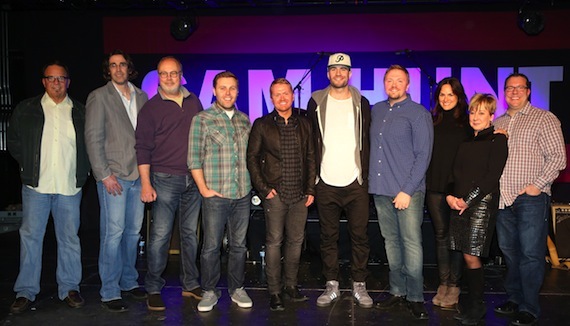 Pictured (l-r): Three Mules Music’s Chris Hunter; ‘Country Aircheck’s’ Chuck Aly; Universal Music Group’s Mike Dungan; producer Zach Crowell; co-writers Shane McAnally, Sam Hunt and Josh Osborne; ASCAP’s LeAnn Phelan; Black River Publishing’s Celia Froehlig; and Universal Music Publishing’s Kent Earls. Photo: Alan Poizner. Sam Hunt had plenty of reasons to celebrate Monday (Jan. 26): his first No. 1 as an artist, his third No. 1 as a songwriter, and the launch of a sold-out headlining tour. So he marked the occasion with a performance at Rocketown in Nashville—complete with breakdancing kids and graffiti artists. 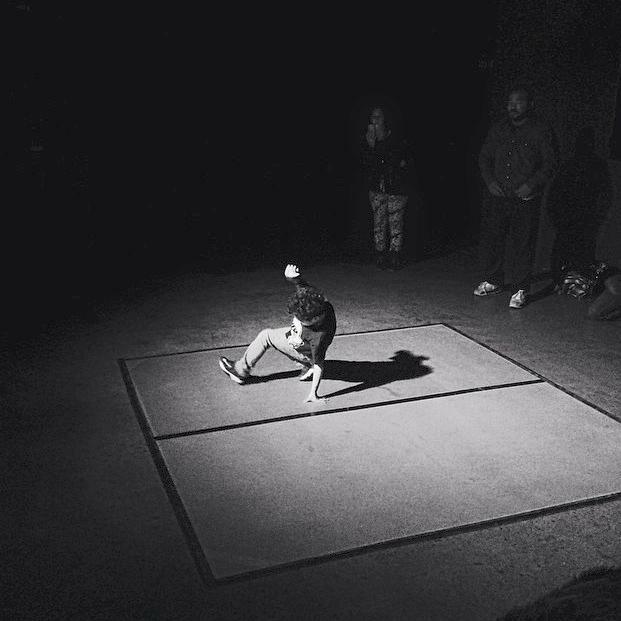 Breakdancers were in the audience at the Sam Hunt tour preview. “You are a game changer,” agreed UMPG’s Kent Earls. “Leave The Night On” has sold one million copies, making it Hunt’s first platinum single as an artist. The follow-up, “Take Your Time,” is the most downloaded country song on this week’s chart. McAnally called his co-producer Zach Crowell a “mindreader” for helping complete the sound they were striving for. “Leave The Night On” is Crowell’s first No. 1 as a producer, though his experience includes manning the boards for LeCrae. His Lipstick Graffiti outing opens Thursday, Jan. 29 with a sold-out show at famed Los Angeles venue The Troubador. Later this year he joins Lady Antebellum’s tour. 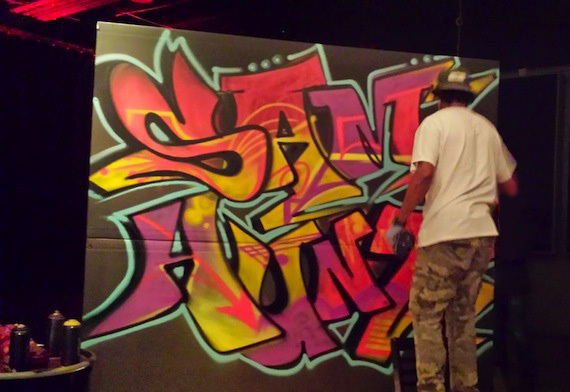 A graffiti artist at work during the party.